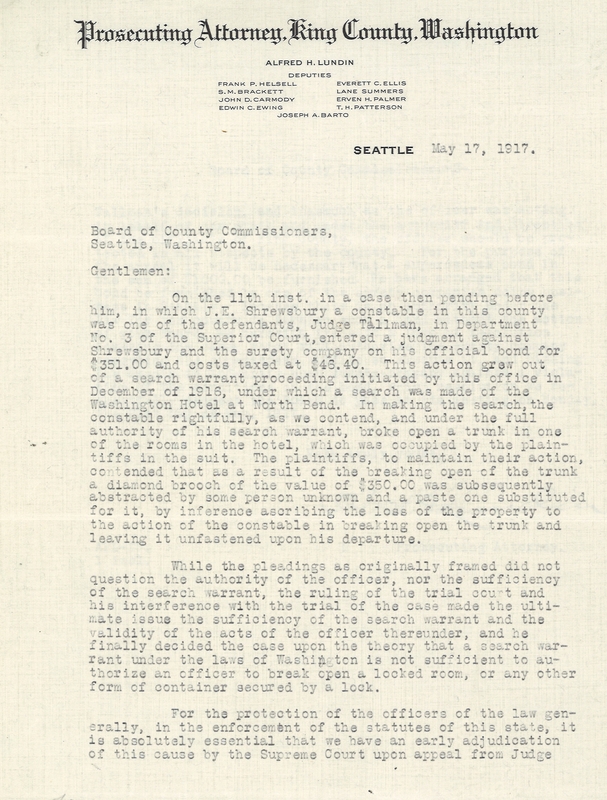 In this post we look back 100 years, through a small sampling of records from the King County Commissioners in the Spring of 1917. On April 6, 1917, the United States officially declared war against the Imperial German Government. 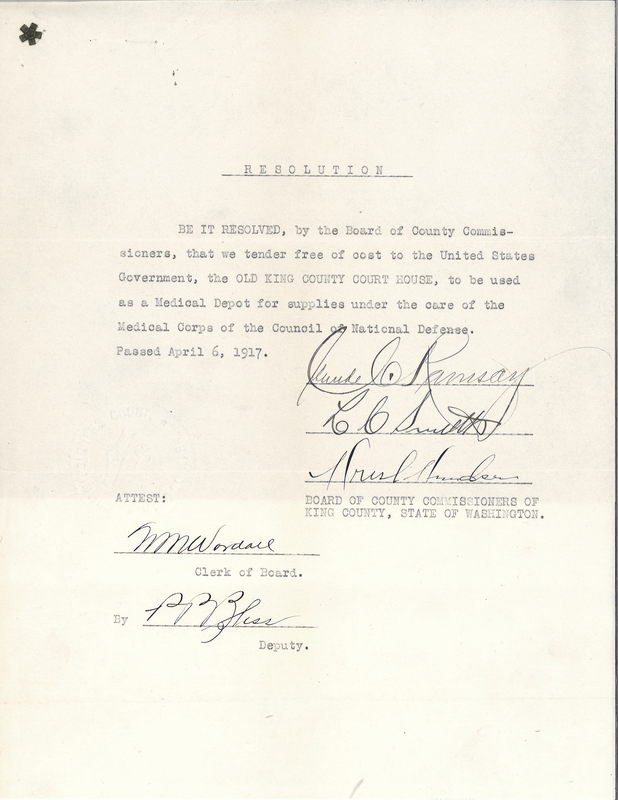 On that date, the King County Commissioners passed Resolution 120 offering County resources for the war effort, encouraging County staff to enlist and guaranteeing their positions upon returning from the War, and promising conservation “to meet, if necessary, the greater and higher needs of the Country.” They also passed Resolution 121, offering use of the old County Courthouse as a depot for medical supplies. Earth Day is April 22. 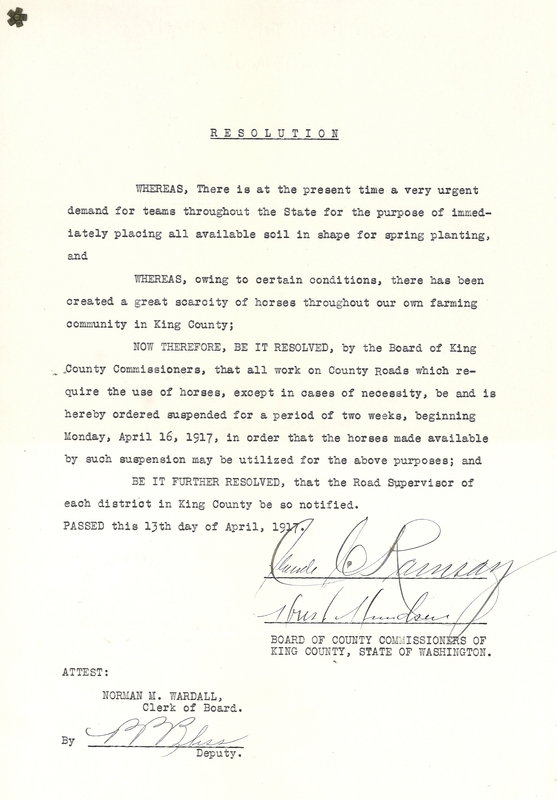 Much has changed in farming since April, 1917, when the Commissioners, in Resolution 125, directed County crews to cease road work so that their horse teams could be used to till the soil of farmlands to support food production. In March of the same year, Resolution 109 funded a night court. 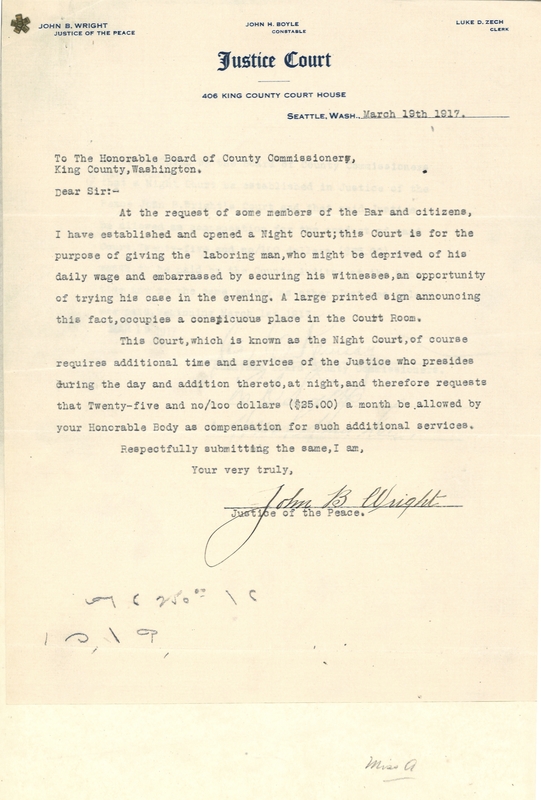 Judge Wright’s letter requesting the funds showed compassion: his stated intent in creating the night court was not only to minimize economic impact on individuals appearing in court, but also to prevent their embarrassment. In the Summer of 1916, Lake Washington was lowered by nine feet as the Lake Washington Ship Canal project moved toward completion. This left shoreline structures “high and dry,” as stated in Resolution 105, which was passed in March of 1917 to revoke a permit for a Mercer Island passenger dock rendered useless by the lowering of the lake. The resolution cover and petition are shown below. The Board of County Commissioners served as King County’s main legislative and executive body until 1969, when the County Charter became effective, creating our current Council-Executive form of government. The adopted resolutions of the Commissioners document decisions such as approval of expenditure of public funds, calls for elections, execution of agreements, enactment of regulations, and creation or restructuring of County government agencies. Specific powers and duties of county commissioners were set out in state law. Resolutions could also be general statements of intent or recognition. Series 124 contains Commissioners’ resolutions from the early 1900s into 1969. The titles of Commissioners’ resolutions for the years 1919-1969 are searchable through our online collection database. A representative box of resolutions is linked to here: Commissioners Resolutions, 1948. As with other records in our collection, these records are available for the public to view in our research room by appointment. We are continually updating our series descriptions to improve online searching. Please feel free to contact us with questions. We are here to help! In June and July, a new exhibit commemorating the centennial of the ship canal’s opening will be on display in the underground pedestrian tunnel between the King County Courthouse and the County Administration building in downtown Seattle. 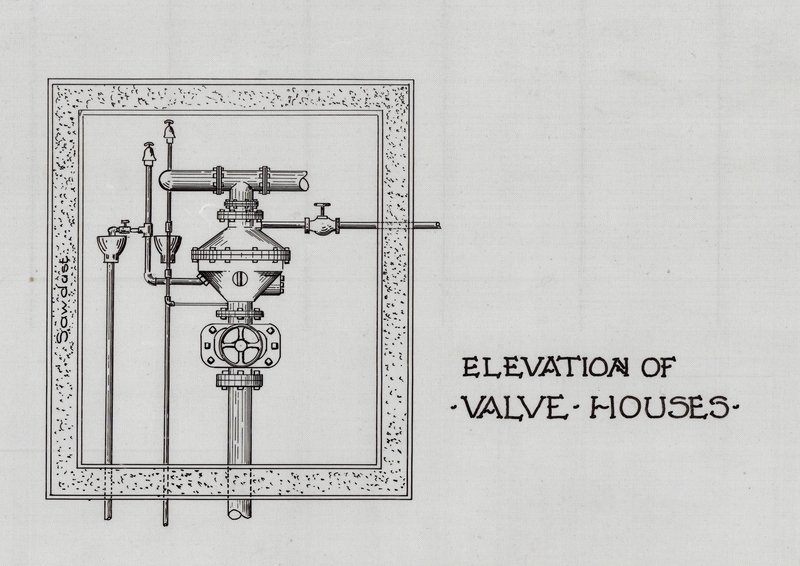 The exhibit will feature drawings, maps, and other records from the King County Archives and photographs from the Seattle Municipal Archives. It will focus on Ballard’s sawmills, which were impacted by the canal. Across King County, local heritage organizations are recognizing this historic engineering project, which significantly modified our region’s geography. To learn about resources and events relating to Ship Canal Centennial, see Making the Cut.